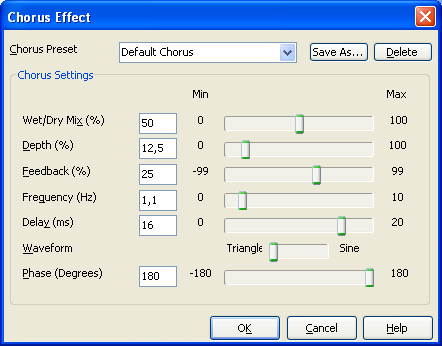 The Chorus effect creates the illusion of two or more sound sources playing together. This is done by adding a pitch-modulated and delayed version of the input signal to the unprocessed input signal. The effect simulates the variances in pitch and timing that occur naturally when two or more people try to play or sing the same thing at the same time. Chorusing is very effective on stringed instruments and can be used as a special effect on vocals and other instruments. Ratio of wet (processed) signal to dry (unprocessed) signal. Percentage by which the delay time is modulated by the low-frequency oscillator, in hundredths of a percentage point. Percentage of output signal to feed back into the effect's input. Number of milliseconds the input is delayed before it is played back. Waveform shape of the LFO. Phase differential between left and right LFOs. Submitted by Melanie on Mon, 01/23/2017 - 00:14. Submitted by nina on Sat, 11/19/2016 - 20:53. Submitted by write my essay for cheap on Tue, 08/30/2016 - 10:45. Should all of those features should be strictly followed in order to get such result? I also think that there might be some alternatives to it and it would be nice if you tell us the main ones.